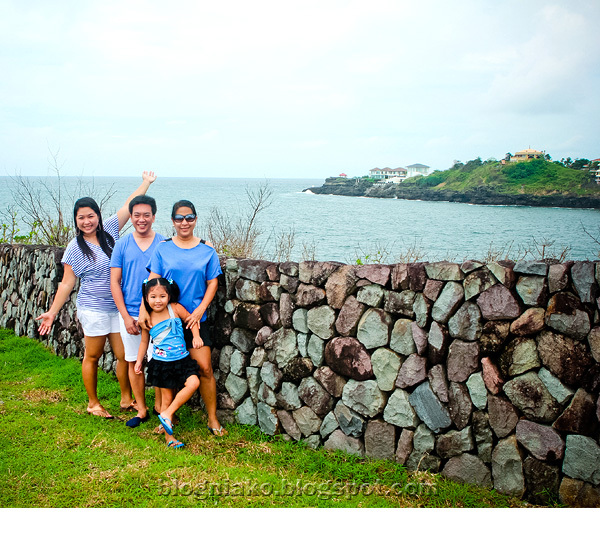 Club Punta Fuego is a world class residential beach resort located in Nasugbu Batangas. This used to be an exclusive resort only open to members/ homeowners and their guests. When I saw the deal being offered on Metrodeal site for 55% off for 2-Days/1-Night Casitas room accommodation, I grabbed the chance to avail without thinking twice! Price was P1,999/pax and 4 vouchers are required per booking. They are now offering it for P1,499/pax! Waaaaaa so unfair! I purchased the vouchers in june and scheduled our trip last Aug 19-20. We were so ecstatic to be on this beautiful resort! Access to resort’s facilities such as: game room,swimming pools, squash and tennis courts, beach etc. Our room was nice, tastefully furnished, spacious with cozy beds but I didn’t like the pillows provided. The place has 4 types of swimming pools. I so love the double infinity pool perched on a cliff edge overlooking the sea! The scenery was awesome! Due to lack of time and the light intermittent rain showers, we were not able to go to the beach but I was able to take a few shots of one of the beaches around the place. There are actually 12 beach coves but only a few are swimmable and some being preserved and protected. We had a fantastic time and would recommend this to anybody. It’s a great place to escape the hustle and bustle of the city! We’ll definitely be back in the future! Because it rained, muds were being washed out from the mountains to the sea reason why the color of the water in the background was brownish. Busog na busog ang mga mat ako sa pictures Anney. Ang ganda ng place ang the little girl looks like she's really having a great time. like ko yung infinity pool! hang layo neh kailangang pag isipan kapag pumunta kami diyan hehehe. from laoag to batangas, whooo hehehe. Wow, sobrang ganda nun place! Hotel room is really nice. And I love the infinity pool! Pasaway lang kung kelan naka-book na kayo saka bumaba yun rate, haha.. I love to go here kaso si hubby lagi sinasabi hindi daw maganda. nagstay na kasi sila diyan e. pero mukhang ok naman sa picture mo. hehe! Ang gaganda ng mga shots mo sis. And I have to say, nainggit ako sa pandan juice na un…hahahah!! pangarap ko jan pumunta ney! 🙂 ill go home to the PH for that! beautiful. kainggit! Beautiful indeed! I really love the infinity pool plus you can't go wrong with that price!as usual lovely pictures anney! Wow mukhang maganda nga diyan! Sarap ng mini-getaway nyo! ang ganda ng pool! infinity! Your niece are really fortunate as they get to travel a lot! Sobrang bet ko yung infinity pool! Nakita ko na 'to sa fb dati, sa friends ko. Huuu. Parang gusto ko din pumunta, kaso parang mahal. Hehe. OMG that looks amazing! That infinity pool looks like the best time ever!! OK itong resort na ito ah. Maganda yung shot sa may infinity pool. Parang bumubuhos yung laman ng pool papunta sa dagat. WOW!!! This makes me miss this place. Been there Holy Week two years ago and it was such an amazing experience. Good to hear they have great deals open for tour now! one night lang din kami sister, the first day nagkulong lang kami sa casitas dahil ang ulan ayaw magpatalo. the next morning pinagbigyan kami kaya nag bike at nag gora na kami agad sa beach. worth ang trip sis di ba? ganda ng punta fuego, may isang beach pa daw dun sa Terrazas yata yun, di na namin pinuntahan yun kasi ang layo. Oh this place is beautiful! Love the pool!!! Sobrang ganda ng place ate! Gusto ko din punta dyan! Medyo mahal pero kayang pag ipunan! LOve it! Oooooo…what a lovely place. You certainly have really fascinating resorts in the Philippines. 55% off, wow!!! That's a good deal! No bands playing at these places. That was one thing I loved about the Philippines when I went many years ago – such talented musicians…at least 3 in one hotel alone. I enjoyed myself so much every night, relaxing over a couple of drinks and listening to them play and sing. Hay nanghihina na naman ako, namimiss kong magswimming sa pool e, hanggang tingin nalang muna kasi ang ganda talaga dyan! I love the pictures! Grabee, ang bongga ng place ha? WOW!!!! Mommy, the place is absolutely spectacular. Well worth the money and the time. Oh my heavens! Love it and your photos as always. Thank you for sharing and for letting us explore through your beautiful photos. 🙂 Love it! I miss Pinas tuloy and the beach and the food. Aha sa metrodeal pala nakukuha ang mga great deals tulad nitong punta fuego:) ano po cam nyo anganda ng resolution! great models of a beautiful place as always! weeee the water is so inviting! Heavenly view!!! Pictures are so vivid..love it! Wowwww love this place, this pictures are fabulous!!! !